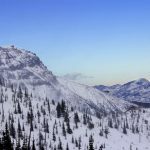 If cat skiing is on your bucket list, Castle Mountain Resort, located in the Southwestern corner of the province of Alberta, Canada, is a must. 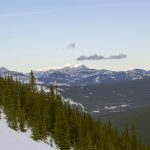 The terrain at Castle Mountain can accommodate skiers of all abilities with 55% beginner/intermediate terrain, steep chutes, the longest continuous fall-line in North America, and cat skiing in the Powder Stagecoach. 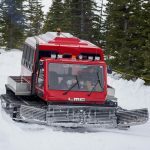 Voted “Best Cat Skiing in Alberta in 2012-13”, the Powder Stagecoach offers powder hounds the opportunity to ski virgin snow and back country terrain in a safe and controlled, in-bounds environment. Our day at Castle Mountain resort began with some introductions and a thorough safety briefing, which included avalanche awareness and rescue training. Afterwards, our group hopped on the Huckleberry Chair which takes you up to the entrance to the cat skiing zone where you board the Powder Stagecoach. The short, 10-15 minute trip provides stunning views of the Rocky Mountains with Mount Haig looming in the distance. Once we arrived at the top of the cat track, we unloaded our ski gear and discussed which run we were about to ski. Our group consisted of 8 guests and 2 guides. Our lead guide, Greg, was helpful in explaining the terrain that we were about to ski before setting off down the slope, on his own, to assess the snow conditions. Greg would ski down a few hundred feet, then stop and radio up to our tail guide, Murphy, a 25-year Castle Mountain veteran. We would then take turns (in groups of 2) skiing down the mountain to meet up with Greg. Once the entire group met up with Greg, we would repeat the process making our way down the mountain until we came to a ski run that skirted across the bottom of the cat skiing zone. This ski run would lead us back to the Huckleberry Chair for another lap. 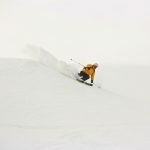 This method of “list-assisted” cat skiing offers many advantages over traditional cat skiing without any drawbacks. Firstly, because the operation is based in the resort, mom can go cat skiing while dad and the kids stay in-bounds and ski on groomed runs like they would at any other resort. Second, If you decide that your legs need a rest or you need to use the bathroom (an actual bathroom) then you can simply stop by the day lodge at the end of your cat skiing run. Third, if you realize that you didn’t wear enough layers of clothing, you can make a quick trip to your vehicle, or slope-side chalet, to grab something warmer. Lastly, but perhaps the most important; Because the Powder Stagecoach uses less fuel by travelling a shorter distance, Castle Mountain Resort has decided to pass the savings on to their guests. The cost for a full day of cat skiing is only $375! That is less than half the industry standard price, and 1/3 of the price of some of the other cat skiing operations. For anyone who hasn’t been cat/heli skiing before, it is a very exciting and safe adventure. 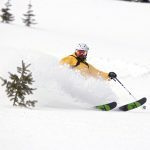 If you’re confident skiing blue runs and comfortable skiing black diamond runs, then you will have a blast cat skiing at Castle Mountain Resort. The resort even offers powder skiing lessons if you’re a bit unsure of your abilities. Each group can expect to ski between 6-10 runs per day, which works out to roughly 20, 000 vertical feet. Lunch and apres-ski beverages are also included. The one thing that I can’t seem to stop dreaming about is the consistency of the snow at Castle Mountain. It’s not dry, blower powder like you would find in Utah or Banff, and it’s not wet and heavy like a coastal ski resort. It’s, for lack of a better word, “creamy”. If you kept your speed up and made conservative turns, you would only sink in 6-8 inches, but throw your hip into a big slash turn and all of a sudden your skiing through snow that’s waist deep! It’s truly incredible. I’ll refer to it as “powder on demand” skiing. We had a great day skiing with the staff and guests at Castle Mountain Resort. If you’re looking for great snow, small lift lines, friendly staff, and western charm then this is the resort for you. Slope-side chalet rentals are available, and there is also a hostel and campsites for the budget-conscious traveler. Scenic views from the top of our run at Castle Mountain Resort. Face shots were plentiful at Castle Mountain Resort. Cat skiing at Castle Mountain Resort is perfect for skiers of all ages and abilities. Throw your hip into a big turn, and instantly your up to your waist in snow! Our lead guide, Greg, hunting for some fresh snow. 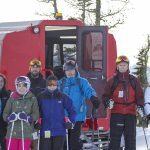 The safety team at Castle Mountain Resort takes skier safety very seriously. Here we are learning avalanche rescue procedures. Our tail guide, Murphy, is a 25-year Castle Mountain Resort veteran. He shared many stories of the area with us throughout the day. That sounds way way more dangerous that you make it out to be. Are you a professional skier? In a lot of ways cat skiing is actually safer than resort skiing. If you happen to fall while cat skiing you land in soft, powder snow. Anyone who has fallen on a groomed resort run will tell you that packed snow is not very forgiving. Also, because you cat ski in small groups, there is less of a chance of running into another skier. Haha, I am not a professional skier. 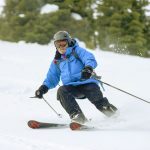 I truly believe that any skier who can confidently ski blue resort runs will have a great day cat skiing. Do you ski or snowboard? What is your favorite resort? Thanks for sharing this, Dude. I’ve always wanted to do this. Do you think it’s better than heliskiing? You’ve done that, right? Would you go back again? I would go cat skiing every day if I could! I have been heliskiing, and asking which is better would be like asking “which better, a Ferrari or a Lamborghini?”. What type of skier/rider are you? What terrain do you like to ride? Once I know a bit more I can give you a much better answer. I go skiing in Alberta at least a handful of times every year but I’ve never been to Castle Mountain. Thanks for the info. I’ll add it to the list of places to visit this year. I’m going to Alberta in February and I was debating where to ski. This is it! I’m booking it tonight.